The all-new Orso 105 from Bianchi features geometry that is neither road bike nor cyclocross bike – it delivers the best of both styles. The Orso 105 features a carbon fiber fork, Shimano drivetrain and hydraulic disc brakes, and Kenda Flintridge 40mm tires. 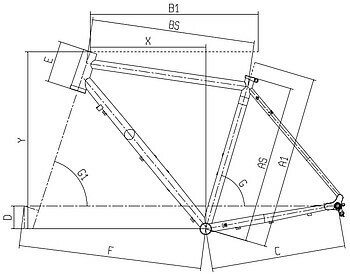 The Orso’s frame geometry was designed to be “long and low” for greater stability on rough surfaces. This bike if for the rider who is ready to tackle the greatest variety of rides from commuting to centuries, long distance touring to backroad bikepacking, and every potential adventure in-between. The chainstays of the Orso are the longest of Bianchi's steel models. This specification allows them to keep the bike balanced and achieve 42mm tire clearance. Front and rear flat mount disc brakes make quick work of scrubbing speed should any of your great ideas turn bad.